Penne pasta slathered with a hearty sausage and mushroom ragu full of bold flavors and fresh ingredients. Today’s post is all about wine and entertaining. Gallo Family Vineyards is celebrating the 50th anniversary of its very popular Hearty Burgundy wine, and we’re going to join the celebration. Are you with me? Of course you are. All it took was the mention of wine, and you guys are already lining up, fancy glasses in hand. Lucky for you, Gallo sent me a twofer (two bottles in one), so I have plenty to go around. The key to entertaining is to make it as stress free as possible. A little planning goes a long way. I’m the meal planner, entertainer, host, and general leader in our family when it comes to entertaining and food preparation. When holidays come around or events pop up, I’m the gal they call. My friends use me as their personal hosting consultant when they’re planning their own gatherings. I get calls and texts regarding food preparation and ingredient selections. I’m honored, but soon I’m going to have to start charging—just kidding, folks. From past experience, I’ve learned to create a menu and stick to it. That means no last minute changes or that-looks-yummy-let’s-add-that additions. When I first started hosting Thanksgiving, I was so excited that I added just about every dish to the menu. I quickly learned that I’m not the Hulk and executing twenty dishes wasn’t possible. Less is more when it comes to planning a menu. One to two appetizers are all you need. For the main course, pick a few, and by a few, I mean four to five items–not ten. One dessert will suffice. We’re looking to trim it down a bit and make it as easy as possible for the host. If you’re responsible for 20+ items, you’ll never get dinner on the table; unless, of course, you have whisking super powers that no one knows about. If that’s the case, carry on. After you plan your menu, compile your grocery list. A grocery list makes shopping so much easier. Having a list helps cut down on the time you’ll spend in the store, and it decreases your chances of forgetting a pertinent item. The last thing you need to occur while entertaining is having to make more than one trip to the grocery store, so don’t forget your list. If you want to get specific, you can categorize your list into sections: produce, dairy, meat, canned goods, etc. Once you have your menu planned and shopping complete, the next thing to do is figure out which items on your menu can be prepared ahead of time. Prepping produce, chopping veggies, and preparing dressings or sauces can be prepared in advance and stored until the day of the event. If you’re making dessert, that can be prepared ahead of time. To make it easier on yourself, choose a dessert that can be prepared a day or two ahead of time. I usually choose cake, pie, or mousse for such occasions. Don’t be afraid to ask for help. Call in some reinforcements. So what if your husband whines. That can be easily solved by threatening his meal ticket to the dinner table. He’ll be slicing and dicing in no time. Today I’ll be entertaining with my hearty recipe for sausage & mushroom ragu, a hearty mixture of spicy sausage, earthy baby portobello mushrooms, tomatoes, wine, beef stock, cheese, and fresh herbs slathered over penne pasta. Gallo Family Vineyards’ Hearty Burgundy wine is smooth and mildly oaky with a subtle hint of sweetness. It’s the perfect addition to recipes made with red meat, sausage, and pasta. Not only did I pair this wine with the meal, I also deglazed the pot with it when making the sauce. It adds a bold pop of flavor to the ragu. For a sauce that comes together in under 40 minutes, the flavors in this dish run deep. The hearty tomatoes mingle with the rich Hearty Burgundy to create a robust sauce full of spicy sausage, sweet red peppers, and fresh herbs. Your guests will love this easy meal. Add a side salad and some crusty bread, and you have yourself a bold meal that comes together in under 40 minutes. 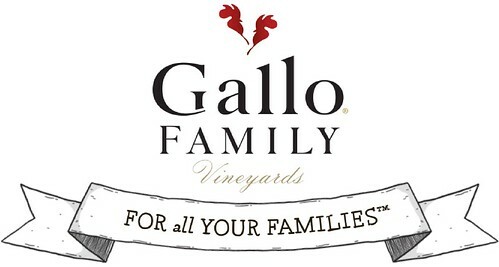 You can follow Gallo Family Vineyards on Facebook, Twitter, Instagram, and YouTube. Click here to find a store near you that sells Gallo Family Vineyards’ wine. Heat 1 tablespoon of olive oil in a large saucepan over medium-high heat. Add the sausage and brown, breaking it up with a wooden spoon as it cooks, until the sausage is cooked through and no longer pink. Remove the sausage from the pan and set aside. Add the remaining tablespoon of olive oil to the pan. Add the mushrooms. Sauté until they begin to brown (do not add salt), cooking for about 4-5 minutes. Add the onion, garlic, red pepper, red pepper flakes, and a generous pinch of salt and pepper. Cook, stirring occasionally, until the onion and peppers soften, about 5 minutes. Stir in red wine, scraping the bottom of the pan to release the brown bits. Cook until the wine reduces to about half, about 3 minutes. Stir in the beef broth, crushed tomatoes, cooked sausage, and, if using, dried herbs. Bring the sauce to a gentle bubble, reduce the heat to medium-low and simmer for 15 minutes. Stir in fresh herbs and parmesan cheese. Give the sauce a sample and add salt and pepper to taste. Turn off the heat and gently fold in the cooked pasta. Serve with a sprinkle of fresh parmesan cheese. Gorgeous and delicious pasta! I want to reach in and grab a bowl of it right now. Mmm! I want this for Sunday brunch. :) Thanks for sharing, Jennie! Lovely pasta dish! And, good thoughts on entertaining, particularly serving just a few really good dishes. This one would definitely be a winner! We were both on the same track this week…now I have to try your yummy version of pasta! It looks fantastic! Jennie, your sausage and mushroom ragu looks SO delicious!!! I’m with you. . so glad that the hearty burgundy was a two in one. . fabulous! can’t wait to try this recipe. . beautifully photographed!!! love! I want you to make this for me for MY birthday dinner! Your pasta looks incredible! I love it and now you have me craving pasta! Yummy!! Pasta and sausage with burgundy sounds like supper to me! Red wine in a gorgeous dish – I am IN! Pinned! You should start teaching classes with your mad hostessing skills! This looks so wonderful. And how FABULOUS are those wine glasses? Love them! This sounds like the perfect pasta dish. Yum! Next time you entertain, I hope I get an invitation. This dish looks spectacular! Great tips on entertaining and grrrreat recipe Jennie! Great tips for entertaining. I need to remember these! I always seem to get really excited and go way overboard – ending in way too much stress. Beautiful pasta! oooooh girl this looks so hearty and comforting!! I love the addition of portabella mushrooms! Yum! Oh wow, I love the way this chunky sauce just clings to that pasta! And such lovely photos and food styling. Wow! That sauce looks AMAZING! Look at those mushrooms – what a delicious addition! This is such a perfect dinner! DANG! This look so awesome! These kind of pasta dishes are my favorite. Plus, loving those green glasses – so cool! Oooh this looks absolutely delicious!I love the flavors here and with the burgundy I bet it makes for the perfect food for entertaining! This looks so good! I’m the party consultant around my friends and family too. You’re right–organization and sticking to a plan/menu is the key! See, my problem with making food for people is that I always overestimate how much they eat. There is no greater humiliation for an Italian than running out of food when entertaining. If you ever need to call in for reinforcements, my dear, I’m here for ya! I love this! So comforting and delicious! I can seriously taste all the flavors and the wine? AAAG sign me up!! Love pastas like these! Simple, yet so complex and flavorful! Looks awesome! I am a huge wine lover, well … and pasta, so you better believe I am lined up waiting with my wine glass and my clean bowl for seconds. I have my serving spoon ready. Come on over! I need to take your tips to heart, Jen. I always have these grand plans on the incredible amount of intricate and difficult dishes I want to serve at dinner parties, along with the pinterest-worthy decorations I want to put up but do I ever execute? No way. It’s too much work. And I never ask for help. I’m an idiot! This sausage and mushroom ragu, though? This is definitely something I’d have no problem preparing and devouring. This looks so delicious! Comfort food at its finest. I used complicate the crap out of my menu and create huge plans that I could never accomplish. Making things simple is your best bet. Thanks, Nancy! I love your photos and this dish! This is my favorite type of meal to put together! You had me at mushroom!! This looks like the perfect dinner recipe! Thanks, Amy! I can see where planning a vegetarian meal could become complicated. Have you heard of the site Oh My Veggies? You should check it out. Great veggie-based meals. Dishing Up the Dirt has a lot of vegetarian recipes as well. Thanks, Jocelyn. The wine glasses were a gift from my grandmother. I believe she picked them up at a yard sale. Thanks, Christina. And, thanks for pinning. I’m the entertainer in my family as well, and I’m always looking for easy dinner recipes to feed a crowd! This looks fantastic! Pasta is my <3!!! And with those mushrooms and sausage?! YES. OMG delicious pasta recipe. I made it yesterday for dinner and my family loved it. Love to see such an amazing dish, Me and my entire family love to enjoy single bites of it. Thanks for sharing.